Campus Kudos is a public acknowledgment given each fall, spring and summer semesters that applauds the efforts of eligible staff members who have displayed an act of kindness up and above their job responsibilities. Anyone may submit nominations using the criteria and this form. 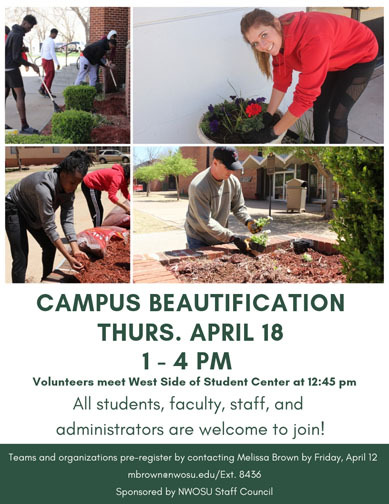 The following examples should be taken into consideration: • Makes a difference to NWOSU and/or to members of the campus community • Goes above and beyond expectations • Excels as a team player • Strives to bring out the Ranger "Spirit" in others. All areas of the form must be completed in order to make a nomination. Each year, the Student Government Association asks for nominations to honor an outstanding staff member through the Thelma Crouch Staff Employee of the Year Award. Below is information regarding the award and a form you may use to nominate someone you think is deserving of such an award. Please contact Calleb Mosburg, Dean of Student Affairs and Enrollment Management, at (580) 327-8415 with any questions. The Thelma Crouch Staff Employee of the Year Award is to recognize exceptional performance and/or service by a member of the Northwestern Oklahoma State University staff. The recipient of this award will show dedication to Northwestern and its students. Nominations will be accepted until 5 p.m. on the first Friday in October. 1. The award is available to full-time employees who are in non-supervisory positions and have been employed at Northwestern for at least five (5) consecutive years. 2. Applications are available in the office of the Northwestern Foundation or use the online form link above. 1. Staff members may be nominated for the award in writing by their supervisors, any member of the faculty/staff or any NWOSU student. 2. A nomination form must be completed and returned to the Student Government Association office located in the Student Center or drop it off at the Student Services office in Fine Arts 126 by the first Friday of each October or submit the online form using the link above. A. Professionalism and dedication to excellent service by putting forth the extra effort. New staff orientation is held every August for employees who have been hired the previous year. Administrative representatives are invited to meet with new staff members personally, provide them with information about the university’s policy and procedures, and then host a luncheon. This project is held every year in April, days before the annual Spring Reunion. 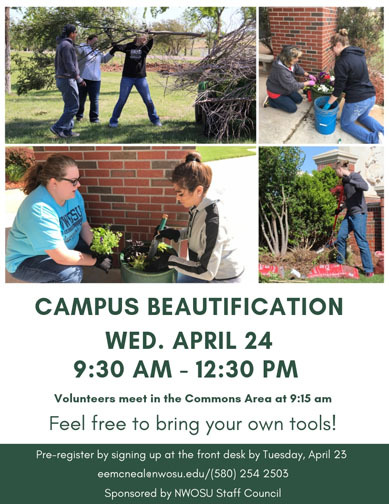 Staff Council coordinates with the Maintenance Department, C.O.R.E., and volunteers of employees and the student body to help clean up the campus grounds. 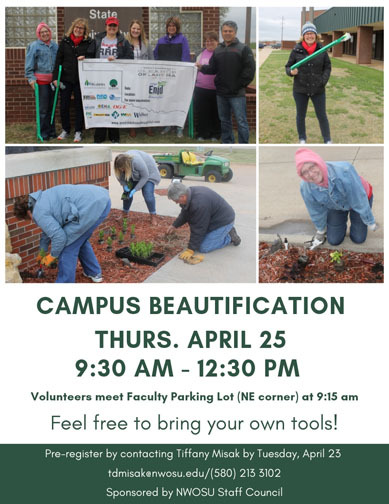 This event gives employees and students the opportunity to show their pride in the campus appearance at all three campuses.